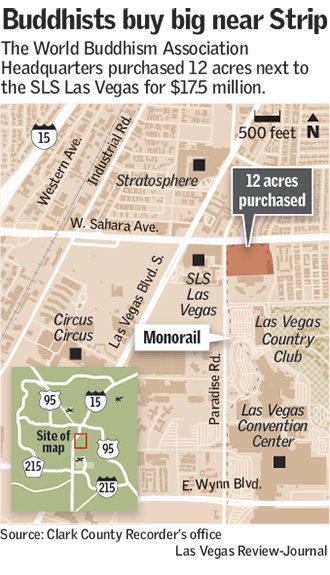 The World Buddhism Association Headquarters bought 12.2 acres of mostly vacant property at Sahara Avenue and Paradise Road, next to the SLS Las Vegas, for$17.5 million. The sale closed July 24, Clark County records show. During a cold afternoon in Budapest in 2014, Buddhism’s purported world leader walked up a hillside with his entourage. The air was chilly and smelly. “It is so stinky!” the followers said. But the Buddha trudged on, and near the mountaintop, a toddler tried to bow before him. The World Buddhism Association Headquarters recounted this story in a post on a religious website. 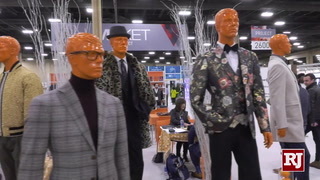 The same group plans to build a temple near the Las Vegas Strip. 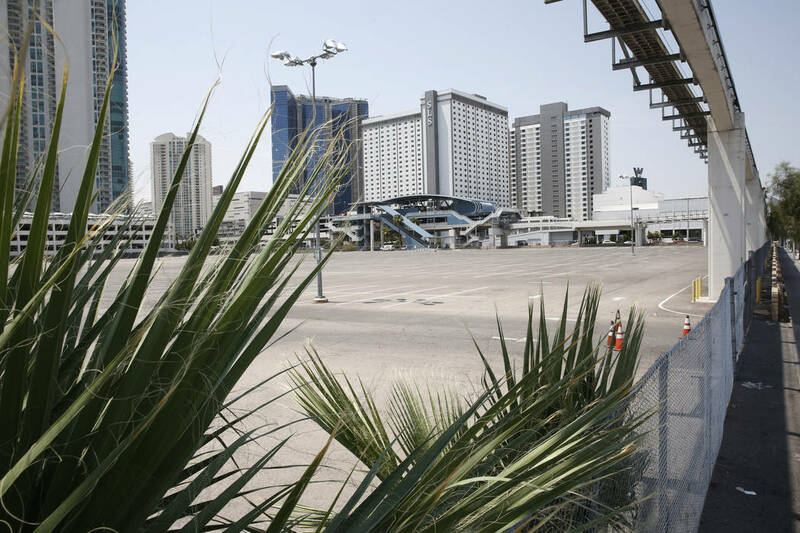 The Southern California-based organization bought 12.2 acres of mostly vacant property at Sahara Avenue and Paradise Road, next to the SLS Las Vegas, for $17.5 million. The sale closed July 24, Clark County records show. The Buddhist group paid cash, according to a broker on the deal. The buyers don’t have the money to start construction. 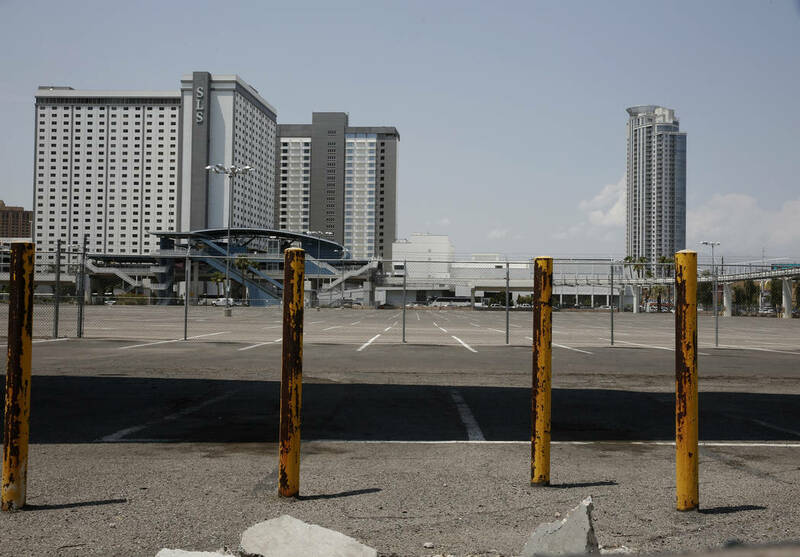 But if they land the funds, they would build an unexpected – if not “deeply ironic,” as one observer put it – project near Las Vegas’ rowdy casino corridor. World Buddhism Association Headquarters attorney Steven Meyers initially said the Buddha “has no relation whatsoever” to the buyers. But federal tax and California state records show links between them — and, according to one news report, the supposed holy man was once wanted for arrest by Interpol. 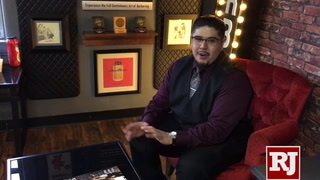 Despite the cash purchase, Meyers said the Pasadena, California-based organization “has very limited funds,” and “there is no possibility of quickly beginning” construction. Raymond Chen, listed in California records as its CEO, could not be reached for comment. Efforts to learn about the group’s day-to-day operations were unsuccessful, though it is mentioned, among other places, on the Xuanfa Institute’s website, where the story of the smelly trek appeared. The website seems devoted to the man who led the hike: His Holiness Dorje Chang Buddha III, an artist and Chinese native also known as Wan Ko Yee. In 2015, the Pasadena Star-News reported that Yee was wanted for allegedly stealing more than $7 million in China. Interpol sought his arrest but eventually backed off, the paper reported. According to Meyers, China asked Interpol in 2009 to withdraw the warrant, and Interpol notified its member countries that they were “not permitted to detain” Yee. Interpol’s press office told the Review-Journal that arrest warrants are always issued by police in member countries, and it referred questions to relevant national authorities. A spokesperson for the Chinese Embassy in Washington did not respond to a request for comment. Federal tax records show that Yee is a former chairman of the International Art Museum of America, which was “first conceived as a permanent museum solely dedicated” to the Buddha’s artwork, its website says. The museum’s corporate secretary and the World Buddhism Association Headquarters’ chief executive have the same mailing address — a house in Monterey Park, California — and the groups have the same chief financial officer, according to California state records. Loretta Huang, director of museum operations, said in an email that she has not had any “dealings” with the World Buddhism Association Headquarters since she joined the San Francisco museum in 2013 and that she learned from a Review-Journal reporter that they share a finance chief. Yee resigned from the museum’s board in 2011, according to Meyers, who also said it’s “very common for one person to hold an office or position in multiple entities,” in reference to the CFO. 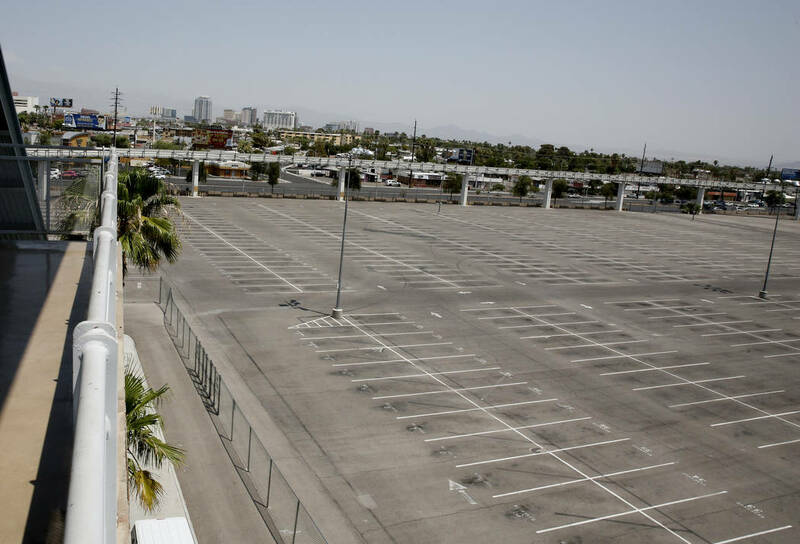 In Las Vegas, the World Buddhism Association Headquarters acquired a parking lot just east of the Strip with a Monorail station along the perimeter. Avison Young broker Ben Millis, who represented the sellers, said his group targeted hotel operators, condo developers and other possible buyers. He couldn’t recall how the Buddhist group even learned about the site. 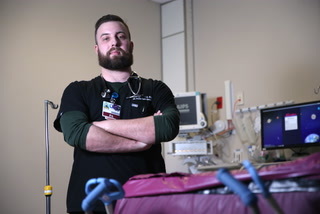 “This was a surprise,” he said. 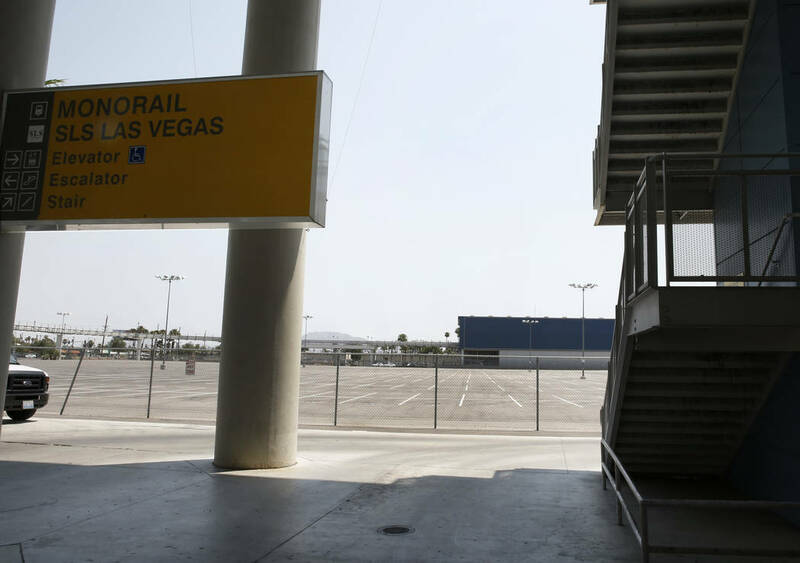 Las Vegas Monorail spokeswoman Ingrid Reisman said the sale will not affect its operations. 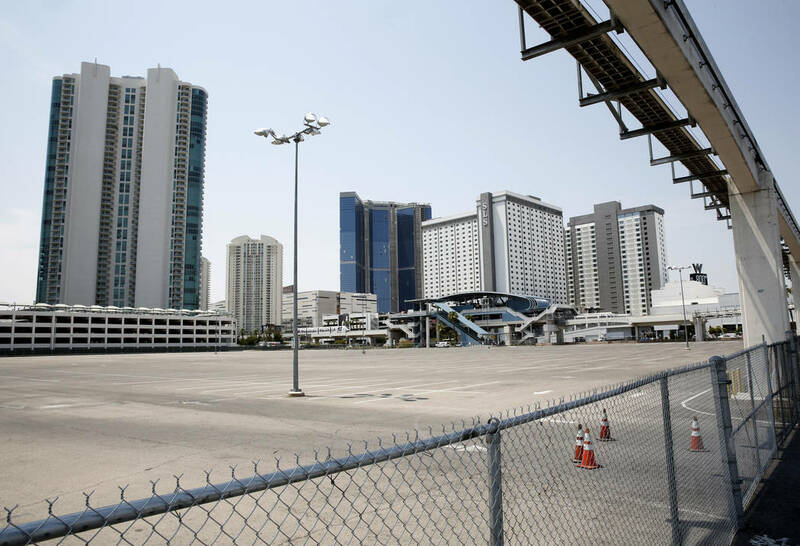 The site was owned by the Bennett family, whose patriarch, the late Bill Bennett, bought or developed several casinos on the Strip, including the Sahara, as the SLS was formerly known. 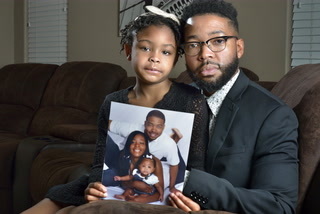 Paragon Gaming co-founder Diana Bennett, Bill Bennett’s daughter, said she had no comment on the transaction because the land was held by a family trust “of which I’m only a part.” The sale was handled by an outside trust company, and Bennett said she was “not really directly involved” in the deal. Michael Parks of CBRE Group, a former listing broker for the site, noted the resort corridor is not devoid of religion. A 1960s-era Catholic church is near the Encore and a 1990s-era Catholic church is near the Tropicana.